There are 1.7 million American children under the age of 18 with at least 1 parent serving in the military. These children never asked to be military brats, yet they do it with grace. Are separations hard on the spouses? Of course. But these kids, they are unsung heroes. We as spouses at least understand “some” of the why. The kids…we try to protect them and to shield them from life’s wrongs, yet their parent is being thrust right into that “place”. In Jacey’s short 10 years, Bryan has missed out on approximately 20 months of her life. And, she is one of the “lucky” ones. Air Force brats don’t typically have to endure the 12-18 month deployments. There are remotes, but those aren’t as common on our side of the fence either as compared to other branches. Still, that doesn’t make the separations easy just because they aren’t as long or often. She had *just* turned 2 years old when Bryan left for the first time longer than a week. He deployed for 4 months and I don’t think Jacey truly understood. She had a Daddy pillow she slept with, listened to him read her stories before bed every night from a cassette tape and kissed his picture goodnight. She took every chance she got to “jabber” to him on the phone and became my cuddle bug. She coped in the only way she knew how. The next “long” separation was 8 months of retraining right after she turned 8. That time, she was busy with school, church and twirling. Her best friend was also a military brat going through a deployment with her Daddy which helped immensely. By this point, Skype was mainstream, so she took every chance to Skype with Daddy that she could. Jabbering once again, only this time making sense. Talking about school, friends and fun. This time is around is MUCH harder. The angst of the tween years has hit. She has a flood of emotions with no clue how to truly express them. If we can get her to write it is wonderful. A sort of therapy. Otherwise, we have battled her acting out much like a toddler. My sweet baby girl who has always been so compliant is no longer. She rarely wants to talk or Skype with Bryan and it breaks our hearts. She shoves her hurt, anger, sadness deep down inside in what we think is an attempt to protect me, to stay strong for me. She is coping in the only way she knows how at this moment. Being a military brat is not easy. Not only do these kids have the normal challenges of childhood/growing up, but they have to do it at times without one or both of the most important people in their lives. Often times, they are forgotten….people don’t think about what they sacrifice. So, in honor of April being Month of the Military Child, I challenge you to find a military brat and say “thank you”. Take them out for ice cream or give them a hug. Remember that they serve too. As a military brat (and proud of it) and a mom of three grown military brats, I want to say that this was an excellent article. Good job! As an Air Force Brat that was born to an Air force Brat, I can tell you that no matter the acting out your Brat is experiencing, she will come out of it stronger and better prepared for life’s challenges and dissapointments. She will see time as filled with opportunity rather than wasting it as so many other young people do. Just keep giving her love and support. With two caring parents in her life, even if separated by distance, there is nothing she cannot accomplish or overcome. 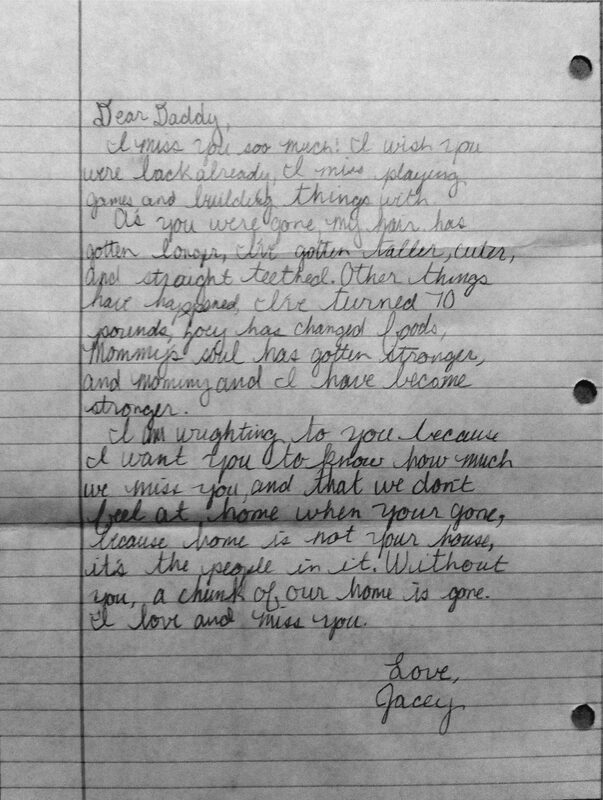 Awww…she was so sweet in her letter. She’s got a great Mama for recgonizing her contribution…and a great family all around (with herself included) for all of your service!